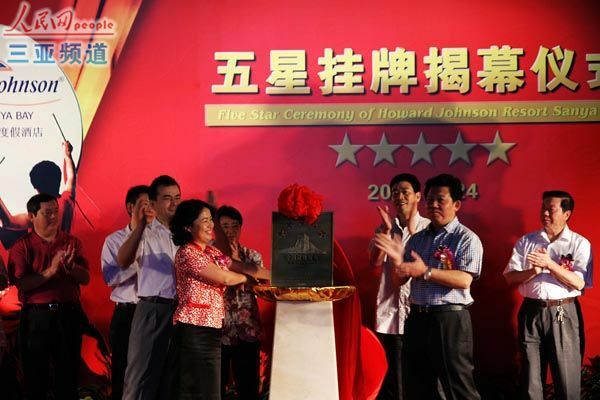 The ceremony was held in Sanya Howard Johnson Resort on 24th Nov.
On November 24, Sanya Howard Johnson Resort, a brand hotel under the management of Wyndham Group Hotels, has been awarded an official, national five-star hotel ranking from China’s Tourist Hotel Star Rating Committee, making it one of the hotels in Sanya Bay with the distinction. Boasting a first-line sea view in the central area of Sanya Bay, the hotel is the largest international five-star seaside resort in China. The hotel features a 4,000-sqm lobby offering spectacular sea views and 1,160 guest rooms including 38 sets of villas. Since it opened two years ago, the 3,000 square meters of meeting space has received more than 300 high-end meeting conferences. This five-star rating is a reflection of the high-quality facilities and service available at the hotel, following an intensive assessment by China’s Tourist Hotel Star Rating Committee which took different factors into account.